Only some 60 years after the invention of the jet engines, flying has become a conventional method of transportation. Once the exclusive privilege of the `swagger rich', it has become as much of a commonplace as a bus trip to the city centre (and in fact, the comfort and service onboard some of the cheapest airlines push the analogy further). Yet, back in the early 1940's, many were seeing jet-powered flight as no more than a `laboratory experiment' (maybe in the same way as we may be, today, sceptical about future applications of the recent `scramjet'). These doubts were not unfounded: materials used in parts of the engine could not survive more than a few hundred hours at then relatively modest temperatures. By the 1950's however, jet fighters were first put in combat over Korea. At the end of the 1960's, commercial jets were accepted, and by the end of the 1980's, the commercial aviation market overtook the military one. 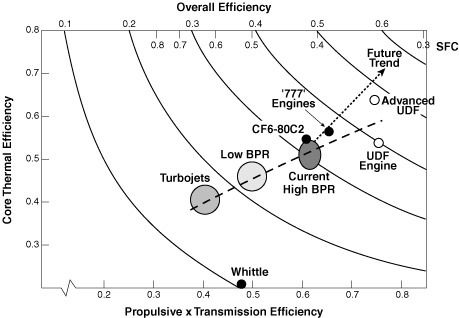 The efficiency of commercial airliners has increased beyond all early expectations, and while it would probably be unfair to single out one factor, improvements in engine materials certainly played a key role. Evolution in engine efficiency, after Pratt & Withney. Obtained from this page. Increase in operational temperature of turbine components. After Schulz et al, Aero. Sci. Techn.7:2003, p73-80. Economical and, today, environmental concerns continue to provide impetus for operating the engines at ever increasing temperatures, thereby improving the thermodynamic efficiency and reducing pollutant emissions. In its early years, the quest for higher temperatures was dominated by materials and processes developments. The apparition of superalloys in the early 1950's, considerable amelioration in casting technologies and, in the 1960's, the cooling system for turbine blades were all major steps forward, each allowing the service temperature to be increased by 20 oC or more. Over the past 20-30 years, alloy improvement, directional and single-crystal solidification have contributed significantly, but, arguably, the emphasis has been shifted to coating systems which have allowed an increase of gas temperature of up to 110 oC. Coatings in gas turbine serve a variety of purposes, whether in jet engines, land-based power generation turbines or marine engines. A first requirement to operate turbines at higher temperatures was, of course, improved strength. Unfortunately, these conditions also mean severe oxidation/corrosion problems, and to make things worse, the improvement in mechanical properties of the base alloys was made at the expense of environmental resistance. The first purpose of coatings was therefore to palliate for the poor oxidation resistance of the base alloy (aluminide, Pt-aluminide, MCrAlY). A second type of coatings applied to high-temperature parts are known as thermal barrier coatings (TBC). These are ceramic coatings with very low thermal conductivity. Despite being typically 1/5 mm thin, the allow for a drop of 100-300 oC between the gas and metal surface temperatures. Such coatings, however, are `oxygen transparent' and do not prevent oxidation of the underlying substrate. To discuss the role and use of coatings, it is necessary to first have a look at a gas turbine (below, a jet engine) and get an idea of the different problems the materials encounter. 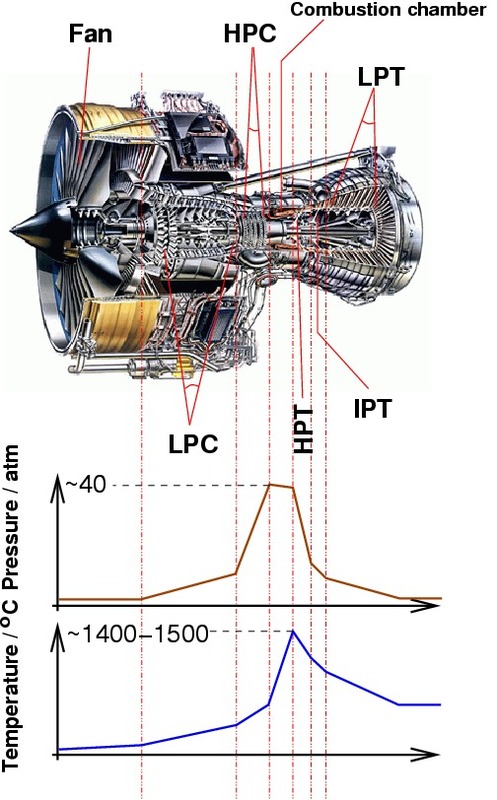 A jet engine (Rolls-Royce Trent 800), showing the different stages: intermediate pressure compressor (IPC), high pressure compressor (HPC), high pressure turbine (HPT), intermediate pressure turbine (IPT), low pressure turbine (LPT), and the pressure and temperature profiles along the engine. Image of the Trent 800 courtesy Rolls-Royce Plc. Diagrams after Michael Cervenka, Rolls-Royce. 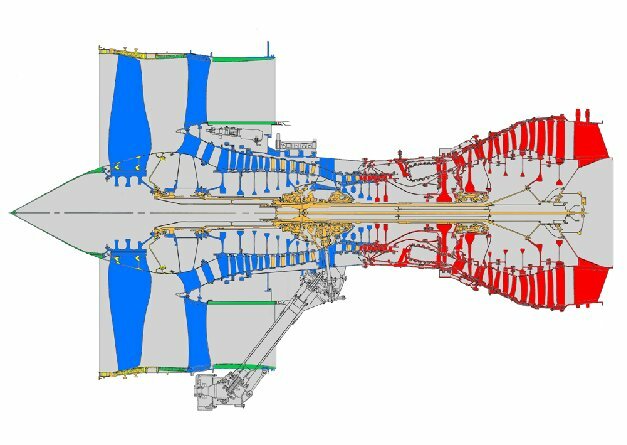 An excellent and simple description of the functioning of a jet engine can be found on the Rolls-Royce website: Journey through a jet engine. General Electrics also has a slightly more detailed yet fun demo. Land-based gas turbines as used in the power generation industry are in principle very similar, but larger, and the actual turbine (the last rows of blades in the engine) is not connected with the rest of the engine, but drives a generator. In some cases however, a first turbine does drive the compressor, while a second is connected to a generator (power generation) or power shaft (marine engine). The different materials used in a Rolls-Royce jet engine. In blue, titanium is ideal for its strength and density, but not at high temperatures, where it is replaced by nickel-based superalloys (red). In orange: steel used for the static parts of the compressor. In this case, 'low temperature' blades are made of titanium alloys, while high temperature components use Ni-base superalloys. The most severe conditions are met in the first row of the turbine. The entry temperature is around 1400 oC. Temperatures are kept lower at the surface of the blade because of the cooling system (ceramic surface approaching 1100 oC), and the thermal coat takes another 1-200 oC leading to a metal temperature in the vicinity of 930 oC. The high-pressure turbine of a jet engine provides one of the most severe environment faced by man-made materials. To temperatures approaching the substrated melting point, one must add the considerable stresses caused by rotation at more than 10,000 rpm. 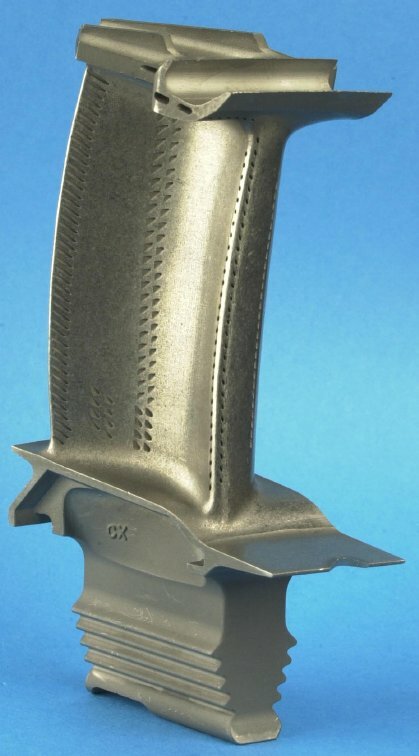 The result of 2500 h low altitude sea flight service on an uncoated and NiAl coated blade turbine blade, from Eskner, 2004. Oxidation is the reaction between the coating (or in its absence, base alloy) with the oxidants present in the hot gases. Hot corrosion occurs from surface reactions with salts deposited from the vapour phase. As discussed in the next section, different service conditions result in different degradation mechanisms being predominant. In addition of oxidation and hot corrosion, coatings will evolve through diffusion with the substrate alloy, as they are not in thermodynamic equilibrium with the latter. This is of concern, not only because it may modify the carefully designed mechanical properties of the substrate, but also because loss of Al to the substrate reduce the oxidation life of the coating. Eskner M., PhD thesis, Royal Institute of Technology, Stockholm, 2004. Typical coatings for high-temperature applications involve an oxidation resistant coating and a thermal barrier coating (TBC). The oxidation resistant coating is also called bond coat because it provides a layer on which the ceramic TBC can adhere. In many papers, TBC is used to refer to the ensemble bond-coat+TBC, in the following, I will use TBC only to refer to the ceramic thermal barrier. Illustration of a typical coating system in a high-pressure turbine blade. 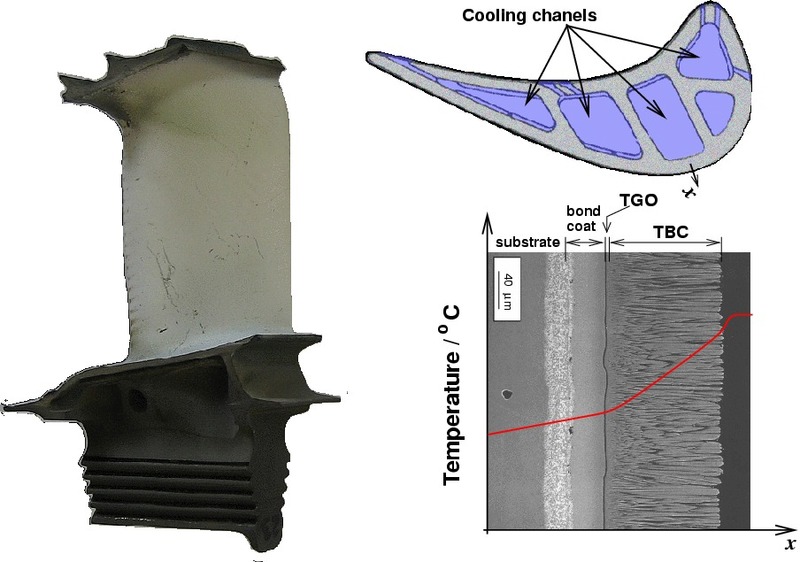 Clockwise, a TBC coated high-pressure turbine blade, view from top showing the cooling systems (image courtesy Michael Cervenka, Rolls-Royce Plc), and schematic profile temperature, note the drop of temperature close to the blade surface due to the presence of a thin cooling air film (SEM picture courtesy M. Pusch). As noted in the introduction, the TBC is oxygen transparent and therefore does not provide any oxydation resistance. Padture et al., Science, 296:2002, 280-284, 'Themal barrier coatings for gas-turbine engine applications'. Recent generations of superalloys for single crystal turbine blades contain relatively high percentages of refractory elements such as Ta, W or Re which enhance the high-temperature mechanical properties (Chen, 1997). This, however, is done at the expense of Cr and Al. Given the severe environmental conditions in which the blades operate, the removal of the elements (beneficial for oxidation resistance) implies even greater degradation problems. To palliate for this lack of appropriate oxidation.corrosion resistance, an external coating is applied to the blades. Its purpose is to allow for the growth of a resistant oxide layer. Of all possible oxides, α-Al2O3 offers excellent protection and very low growth rates (in a minority of cases, Cr oxides are preferred). The composition of the coating must therefore be chosen carefully so as to ensure growth of α-Al2O3. Optimum coating composition in relation to oxidation and hot-corrosion resistance, after M. Schütze, Corrosion and Environmental Degradation Vol. II, Wiley-VCH, 2000. The two most widely used types of coatings are aluminides (NiAl or Ni2Al3) and MCrAlY (`emcrawlee', where M is Fe and/or Cr) coatings. The formers are obtained by surface enrichment by diffusion, the later by plasma spray or EBPVD. An additional ceramic coating is often applied to high-temperature components (TBC, thermal barrier coating). In this context, the oxidation resistant coatings also provide a `transition' layer on which the TBC adheres better than on the substrate. For this reason, the oxidation resistant layer is also referred to as bond coat. When the Al content of the coating is too low, other oxides than α-Al2O3 may form, the nature of which depends on the exact composition of the coating. For reasons which will be explained later on, this can result in failure and is therefore to be avoided. 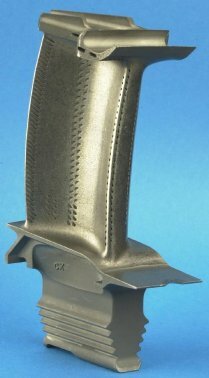 Blade integrity is now critically dependent on these coatings and possibly additional ceramic thermal barrier coatings. Unfortunately, `prime-reliability', the concept of a coating whose life does no longer condition that of the blade, has not been achieved yet. With the increasing cost of the blades themselves, the practise of coating renewal has developed. In this operation, a gas turbine is taken apart, each blade is dismantled, its surface cleaned and a new coating applied. With, on one hand, the prospect of coating failure leading to catastrophic blade loss, and on the other hand an extremely expensive maintenance process, it is no surprise that much research is dedicated to improving the evaluation of remnant life. Chen J. H. et al., Surf. Coat. Techn., 92:1997, 69-77, 'Degradation of the platinum aluminide coating on CMSX4 at 1100 C'. M. Schütze ed., Corrosion and Environmental Degradation Vol. II, Wiley-vch, London, in Materials Science and Technology series. In modern applications involving very high temperatures or severe hot corrosion problems, aluminide coatings provide relatively limited protection. They are nevertheless still widely used in less demanding applications. 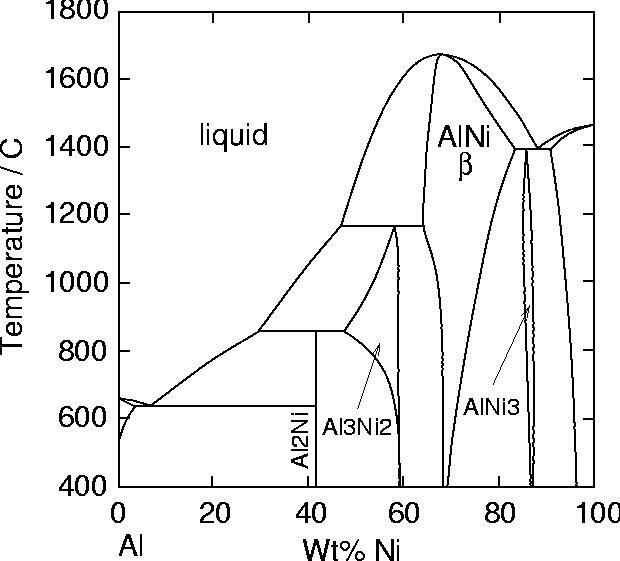 Diffusion aluminide coatings are based on the intermetallic compound β-NiAl (see phase diagram). Although different processes exist to form them, pack cementation is the most widely used as it is inexpensive and well adapted to coating of small parts. Pack cementation falls in the category of chemical vapour deposition. In this process, the components to be coated are immersed in a powder mixture containing Al2O3 and aluminium particles. About 1-2 wt% of ammonium halide activators are added to this `pack'. This is then heated to temperatures around 800-1000 oC in argon or H2 atmosphere. At these temperatures, aluminium halides form which diffuse through the pack and react on the substrate to deposit Al metal. The activity of Al maintained at the surface of the substrate defines two categories of deposition methods: low and high activity, also referred to as outward and inward diffusion respectively. In cements with low aluminium contents (low activity/outward), the formation of the coating occurs mainly by Ni diffusion, and results in the direct formation of a nickel rich NiAl layer. The process requires high temperature (1000-1100 oC). In service, the interdiffusion with the substrate is very limited and the gradient of Al in β is low. In cements with high aluminium contents (high activity/inward), the coating forms mainly by inward diffusion of aluminium and results in formation of Ni2Al3 and possibly β-NiAl. Aluminizing temperatures can be lower (700-950 oC). There can be a high Al concentration gradient in the coating, and also significant interdiffusion with the substrate during service. For these reasons, a diffusion heat-treatment is generally given at 1050-1100 oC to obtain a fully β layer. Microstructures of two types of aluminides coating on superalloy, left: high activity/inward diffusion, right: low activity/outward diffusion, from M. Eskner, PhD thesis, Royal Insitute of Technology, Stockholm, available here. The structure and composition of the coating depends on the substrate, implying that coatings must be tailored for a given alloy. Aluminide coatings lack ductility below 750 oC. One of the major problems faced by aluminide coatings is thermomechanical fatigue, as cyclic strains induced by temperature gradients in the blades can lead to thermal fatigue cracks. The substrate composition strongly influences the final microstructure of the system, in a manner which also depends on the process. In low activity/outward diffusion coatings, the alloying elements present in the substrate will also tend to diffuse into the coating layer, to an extend limited by their solubility. In high activity/inward diffusion coatings, they enter in solution the compound layer in formation, or as precipitates potentially forming during the treatment. Of the elements present in the alloy, titanium is thought to be particularly detrimental to the oxidation resistance of such coatings, as it leads to the formation of TiO2 crystals which break the alumina layer. An typical microstructure of low activity aluminide coating is illustrated below. The external zone is typically Al rich β-NiAl, while the internal one is Ni rich. 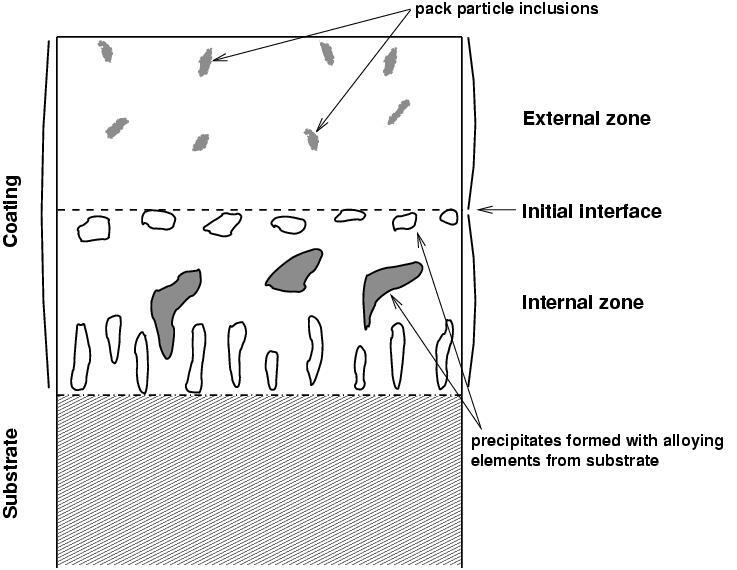 Schematic illustration of aluminide coating obtained by low activity pack cementation. 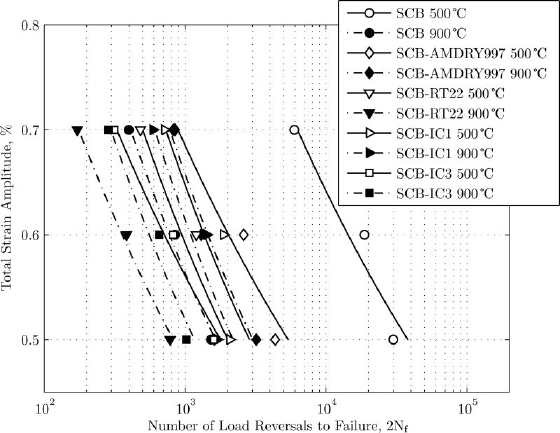 After R. Pichoir, in High Temperature Alloys for Gas Turbines, D. Coutsouradis et al., eds. (Appl. Sci. Pub., London, 1978), p. 191. R. Pichoir, Aluminide coatings on nickel or cobalt-base superalloys, in High Temperature Alloys for Gas Turbines, D. Coutsouradis et al., eds., Appl. Sci. Pub., London, 1978, p191. Metallic and Ceramic Coatings, Production, High Temperature Properties and Applications, M.G. Mocking et al., Longman Scientific and Technical, Marlow. Cocking J. L. et al., Surf. Sci. Techn., 36:1988, 37-47, 'Comparative durability of six coating systems on first-stage turbine blades in the engines of a long-range maritime patrol aircraft'. Sivakumar R. et al., Surf. Sci. Techn., 37:1989, 139-160, 'High temperature coatings for gas turbine blades: a review'. DeMasi-Martin J. T. et al., Surf. Coat. Techn., 68/69:1994, 1-9, 'Protective coatings in the gas turbine engine'. Zhang Y., 'Aluminide coatings for power-generation applications', Technical Report, ORNL/Sub/01-47035/01, available here. NiAl coatings tends to suffer strongly from interdiffusion with the substrate, which results in formation of γ' at the expense of β. 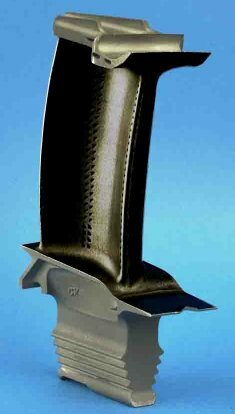 The idea of introducing a diffusion barrier lead to the invention of the Pt-aluminide coatings, which are obtained by similar methods as conventional aluminide, but after electroplating the blade with Pt. The layer of Pt deposited is typically of 5-10 μm (Schütze, 2000). Because the plating can increase the life of the blades by up to three times (Sivakumar, 1989), the cost of Pt plating is easily compensated. Interestingly, it was found that Pt additions not only did not provide a diffusion barrier, but also enhanced Al diffusion (Chen, 1997). When applied on the second generation superalloy CMSX4, Pt formed TCP (topologically close-packed) phases with some elements of the substrate (Re, W, Mo, Cr). The exact reasons for the beneficial effect of Pt are not fully understood, but it was found that Pt improves oxide adherence and also contributes to better hot corrosion resistance. Pt appears to partially substitute Ni in β-NiAl, and also to form PtAl2 which is believed to act as an Al reservoir. It has also been proposed that Pt acts in a similar manner as Y in MCrAlY coatings. In these coatings, Y combines with S; this greatly increase the coating life as S is otherwise detrimental to the adherence of the oxide layer. There is nevertheless no evidence of a similar effect of Pt in β-NiAl coatings (Evans, 2001). Kim G. M. et al., Scripta Mater., 46:2002, 489-495, 'The effect of the type of thermal exposure on the durability of thermal barrier coatings'. Evans A. G. et al., Prog. Mater. Sci., 46:2001, 505-553, 'Mechanisms controlling the durability of thermal barrier coatings'. As discussed in previous sections, aluminide coatings strongly interact with the substrates and must therefore be tailored for each different alloy. Overlay coatings as opposed to diffusion coatings, provide more independence from the substrate alloy, but also more flexibility in design as compositions can be modified depending on the degradation mechanisms expected to prevail. Typical MCrAlY bond coats (M=Fe,Co or Ni) contain at least 4 elements, which means that coating methods such as pack cementation are considerably more difficult to use, as the activity of each element in the pack would have to be controlled carefully so as to obtain a coating of required composition. The presence of a significant amount of Cr give these coatings excellent corrosion resistance combined with good oxidation resistance. Alternative methods are therefore preferred, such as air plasma spray (APS), low pressure plasma spray (LPPS), or electron beam physical vapour deposition (EBPVD). These are detailed in other sections. Deposition is followed by a high-temperature heat-treatment in vacuum to allow interdiffusion and therefore improve adhesion (for example, Richard 1996) . MCrAlY coatings typically exhibit a two-phase microstructure β+γ. The presence of γ increases the ductility of the coating thereby improving thermal fatigue resistance. As for β-NiAl coatings, high temperature exposure results in depletion of the Al both to the TGO (thermally grown oxide) and to the substrate by interdiffusion. As the amount of Al decreases, the β phase tends to dissolve. For this reason, it is often described as an aluminium reservoir, and coating life often measure in terms of depletion of β.
Schematic illustration of MCrAlY microstructure. Al diffusion to the oxide layer and the substrate result in depletion of beta from both sides. The M of MCrAlY stands for either Ni or Co, or a combination of both (when applied to steels, it can also be Fe), depending on the type of superalloy. Co-based appear to have superior resistance to corrosion. 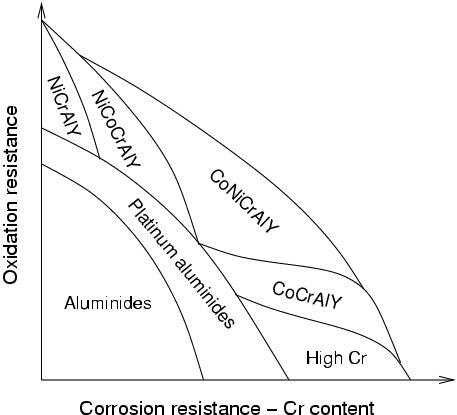 Cr provides hot-corrosion resistance, but the amount that can be added is limited by the effect it is expected to have on the substrate, and the formation of Cr-rich phases in the coating. Al content is typically around 10-12 wt%. Since oxidation life is essentially controlled by the availability of Al, it would be tempting to increases the alulminium content. However, this results in significant reduction of ductility (for example, Sivakumar, 1989). MCrAlY also typically contain 1 wt% yttrium (Y), which enhances adherence of the oxide layer. It was initially thought that Yttrium helped the formation of oxide pegs which helped anchor the oxide layer to the coating. However, it has been shown that there is little if any correlation (Smeggil, 1987), and it is now believed that the main role of Y is to combine with sulfur and prevent its segregation to the oxide layer, which is otherwise detrimental to its adhesion. The effect of other additions has also been investigated (Nicoll, 1982). It was found that silicon (Si) significantly improved cyclic oxydation resistance, however it also decreases the melting point of the coating. 5 wt% are enough to lower the melting temperature to about 1140 oC. There is also evidence that it affects phase stability. For cyclic oxidation at 1000 oC, 2.5 wt% was found to be the optimum content. Further additions were detrimental. Additions of rhenium (Re) have been shown to improve isothermal or cyclic oxidation resistance, and thermal cycle fatigue (Czech et al., 1994). Additions of tantalum (Ta) can also increase the oxidation resistance. Nicoll A. R. et al., Thin Solid Films, 95:1992, 21-34, 'The effect of alloying additions on M-Cr-Al-Y systems - An experimental study'. Smeggil J. L., Mater. Sci. Eng., 87:1987, 261-265, 'Some comments on the role of yttrium in protective oxide scale adherence'. Sivakumar R. et al., Surf. Coat. Techn., 37:1989, 139-160, 'High temperature coatings for gas turbine blades: a review'. Czech et al., Surf. Coat. Techn., 68:1994, 17-21, 'Improvement of MCrAlY coatings by additions of rhenium'. Richard C. S. et al., Surf. Coat. Techn., 82:1996, 99-109, 'The influences of heat-treatments and interdiffusion on the adhesion of plasma-sprayed NiCrAlY coatings'. The role of thermal barrier coatings (TBC) is, as their name suggests, to provide thermal insulation of the blade. A coating of about 1-200 μm can reduce the temperature by up to 200 C.
to reduce the need for blade cooling (by about 36%), while maintaining identical creep life of the substrate. increase considerably the creep life of the blade while maintaining level of blade cooling (and therefore allowing the blade to operate at lower temperature for an identical turbine entry temperature). The benefits of TBC in terms of engine efficiency are comparable to those brought be the replacement of directionally solidified alloys for single crystal ones (Strangman, 1985). Because they allow surface temperatures higher than the melting point of the substrate, ensuring the integrity of TBCs is critical. Understanding the mechanisms of TBC failure is an active area of research. The failure is linked with large residual compression in the underlying thermally grown oxide (TGO), but details of the mechanism only begin to be understood (Evans et al., 2001). Strangman T. E., Thin Solid Films, 127:1985, 93--105, 'Thermal barrier coatings for turbine airfoils'. For a ceramic coating to have any chance not to spall at the first thermal cycle, it is critical that its thermal expansion be close to that of the substrate. For the coating to be of use, it must also exhibit a very low thermal conductivity. For this purpose, yttria(Y2O3)-stabilised zirconia(ZrO2) (YSZ) is widely used. The addition of 5-15% yttria stabilises the zirconia in its high-temperature crystalline form, therefore avoiding phase-transition in the range of service temperatures. Schematic microstructure of a thermal barrier coating (TBC) obtained by electron beam physical vapour deposition (EBPVD). The columnar microstructure considerably enhances the strain resistance and therefore thermal cycling life. TBC coatings deposited by APS or LPPS (low pressure plasma spray) offer a thermal conductivity significantly lower than that of a fully dense coating (0.9-1 W/(m.K)), as the boundaries and pores tend to lie parallel to the surface and therefore perpendicular to the temperature gradient. By contrast, the thermal conductivity of EBPVD TBC is not as low (1.8-2 W/(m.K)), and lowering it further would imply further benefits (Schultz, 2003). EBPVD TBCs are nevertheless preferred becauce of the strain tolerance imparted by the microstructure. In jet engine operating conditions, the lifetime of TBC coatings obtained by EBPVD has been reported to be between 8 and 13 times longer than equivalent system where the TBC was deposited by plasma spray (Schulz, 2003). However, industrial experience indicates that the superiority of EB-PVD TBCs is not maintained in the operating conditions of land-based gas turbine, in which APS tends to give the best performances (Wells, 2004). Current research includes attempts to tailor the microstructure of the TBC to include benefits of both types of microstructures. Padture et al., Science, 296:2002, 280-284, 'Themal barrier coatings for gas-turbine engine applications. Schulz U., Aero. Sci. Techn., 7:2003, 73-80, 'Some recent trends in research and technology of advanced thermal barrier coatings'. Wells J., RWE Innogy, Personal communication. There is a large number of competing processes for coating surfaces, and only a few of them will be presented in the next sections, which are the most relevant to the application of overlay coatings (MCrAlY) or TBC. Coating processes can be broadly divided in methods by which atoms attach individually to the surface, or methods which apply particles. Physical vapour deposition (PVD) or chemical vapour deposition (CVD) are examples of the former. Thermal spraying methods fall in the second category. Thermal spraying: air plasma spray (APS), low pressure plasma spray (LPPS), high velocity oxyfuel spray (HVOF) etc. Thermal spraying consists in metling a consumable (most often powder or wire) and project it as molten particles onto the substrate. Upon impact with the substrate, the molten particle flatten and solidify very rapidly. The adhesion is primarily mechanical (for this reason, sprayed MCrAlY coatings are often given a diffusion heat-treatment to obtain good adherence). A sprayed coating will typically include voids (i.e. have some percentage of porosity), and oxide particles. The amount of both depends on the method employed. All thermal spraying processes are line-of-sight processes, that is to say, only the parts of the component which are directly in the line of the spray are coated. Schematic microstructure of thermal spray coating, showing only a few layers of particles. The adhesion of the coating depends on the cleanliness of the substrate surface, and its area (a high surface roughness is desirable for good adhesion), on the velocity of the particles, etc. Flame spraying: the first method employed uses an oxyacetylene flame (about 2700 \degc) to melt and project the coating, fed as wire, rod or powder. Typical particle velocity is about 40 m/s, porosity 10-15 %, identical oxide content, for a deposition rate of 1 to 10 kg/h. Plasma spraying: similar but uses a ionised gas plasma to melt and propel the coating (powder), temperature of the plasma can exceed 16,000 \degc, while the substrate itself will seldom heat beyond 150 \degc. Particle velocity can reach 200-300 m/s, the porosity is reduced to 5-10 %, the oxide content to 1-3 % for deposition rates of 1-5 kg/h. High velocity oxyfuel(HVOF): spraying uses oxygen and hydrogen with a fuel gas such as methane, particle velocity ranges between 600-1000 m/s, oxide and porosity are reduced to 1-2 % for a deposition rate similar to that of plasma spray. A couple of interesting variants of the conventional plasma spraying are known as low pressure plasma spraying (LPPS) and vacuum plasma spray (VPS), which, as indicated by their names, are identical to plasma spraying except for it being done in inert gas at low pressure, or in vacuum. This reduces slowing and cooling the particles by air, and avoids oxidation during spraying. The traditional method is usually referred to as APS (air plasma spray). APS and LPPS are widely used to apply MCrAlY coatings. TBCs can also be applied by this method. In the case of jet engine operation conditions, it has been shown that the use of EBPVD increases by 7 to 13 times the life of the coating, therefore easily compensating for the higher cost of the latter process. In the case of land-based power generation, APS TBCs last up to twice the life of EBPVD coatings, although the reason is not clearly understood (Wells, 2004). TWI: flame spraying, HVOF spraying, arc spraying, plasma spraying. There is also a good introduction to plasma spraying here. As indicated by its name, electron beam physical vapour deposition belongs to the more general category of physical vapour deposition. In these methods, film growth is obtained by condensation of a vapour on the substrate. The vapour can be produced by heating the consumable enough to obtain evaporation, or by mechanically knocking the atoms off (e.g. sputtering). 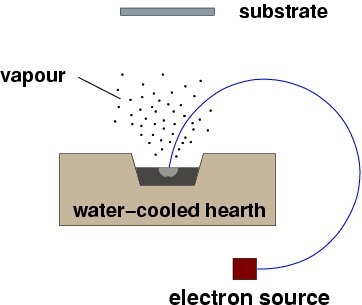 In EB-PVD, the evaporation is obtained with a focused electron beam, as illustrated below. A simple EBPVD process, the whole assembly would be under vacuum. Rotation of the electron beam is obtained by a magnetic field perpendicular to the drawing. EBPVD and PVD methods in general are semi-line-of-sight, and produce a surface that replicates the original one (an initially smooth surface will result in a smooth coating). (DeMasi-Marcin, 1994). As discussed in the section on materials for TBCs, EBPVD TBCs offer vastly longer lifes in jet engine operating conditions, and EBPVD is therefore the preferred process for application of these coatings. This success does not translate well to the operating conditions of land-based gas turbines, for which APS TBCs perform best (Wells, 2004). Current research focusses on tailoring the structure of the deposited coating. For example, directed vapour deposition (DVD) was used to obtain a TBC with a zig-zag microstructure which offered a thermal conductivity as low as APS TBCs while retaining strain tolerance (Levi, 2004). Levi C. G., Current Opinions Sol. Stat. Mater. Sci., 8:2004, 77-91. DeMasi-Marcin, Surf. Coat. Techn. 68/69:1994,1-9. Research at IPM labs, with more detailed description of EBPVD machines and Directed Vapour Deposition. It is difficult to draw general rules as to which coating is used in which application. Even for a given application and a given engine, different commercial strategies may imply different choice of coatings: opting for a higher efficiency and therefore higher temperatures at the expense of long life means that the operating conditions are changed, and the dominant degradation mechanisms may be different. Jet engines and land based power generation turbines provide different environments. In general, jet engines high pressure turbine blades (HPT blades) are expected to last for about 30,000 h. For land-based power generation, this figure can vary between 50,000 and 75,000 h (about 9 years). HPT blades in jet engine will typically undergo one refurbishment (strip coating and re-coat) throughout their life; in power generation applications, one or two refurbishments depending on the target life. cost of refurbishment: variable: 0.3 to 1 million gbp. The HPT blades in jet engines mainly suffer from oxidation; Pt-aluminide coatings are preferred in these conditions and are commonly used to coat the main surface. A jet engine HPT blade. Photo courtesy S. Tin, Rolls-Royce UTC. Alumimised jet engine HPT blade. Photo courtesy S. Tin, Rolls-Royce UTC. They are also used to coat the internal cooling chanels in power generation applications, this choice being mostly dictated by the process (as discussed earlier, aluminide coatings are typically obtained by pack cementation, which is a non-line-of-sight process allowing the coating of complex geometry). Other parts of the HPT blades in jet engines may however receive a different coating: the base and tips often receive an MCrAlY coating as corrosion can be more important at these locations. 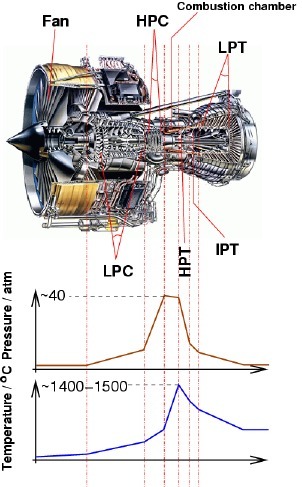 The conditions in the low pressure turbine are considerably less severe than in the HPT. Blades are simply aluminised; they are not cooled and do not receive a TBC coatings. In the case of land-based gas turbine, they are not necessarily made of superalloys, but the coating may contain additions to enhance corrosion resistance. This subject is slightly off-topic and is only covered very very briefly. Abradable coatings are used to reduce the clearance beetween the tip of the blade and the casing, to an extent that precision machining cannot achieve. MCrAlY or TBC coatings are used depending on the component temperature. For this purpose, a high porosity is usually desirable and thermal spraying is therefore ideal. The use of abradable coatings can result in up to 1% improvment in efficiency. The application of coatings to superalloys has mechanical side-effects which can lead to the premature failure of coated components via low-cycle fatigue (LCF) and thermo-mechanical fatigue (TMF). These are often the limiting modes of degradation in gas turbines. Mismatch in the properties of the coating and the substrate alloy are responsible for exacerbating the failure mechanism. The mismatch may arise due to differences in the thermal expansion coefficients, ductility, strength and elastic moduli, and can significantly reduce the fatigue life. The mechanical behaviour of the coated systems under the influence of LCF and TMF has been studied using experiments that simulate the operational conditions of gas turbine parts. The tests were performed on three nickel-based superalloys, polycrystalline IN792 and two single-crystal alloys designate CMSX-4 and SCB, and four different coatings: an overlay coating AMDRY997 (NiCoCrAlYTa), a platinum modified diffusion coating RT22 and two innovative coatings with NiW diffusion barrier (IC1 and IC3). The LCF tests were performed at two temperatures, 500°C and 900°C, and three strain ranges, 1.0, 1.2 and 1.4% with R = 1 and no hold time in laboratory air (R is the ratio of the minimum strain to its maximum value). During the TMF tests the phase relation between temperature and mechanical strain was out-of-phase (OP). The OP-TMF tests were run between 250°C and 900°C with R = 1 at three strains, 0.8, 1.0 and 1.2%, in laboratory air without any dwell time. The coatings changed the fatigue life of the substrate. At 500°C all coatings had a detrimental effect on the LCF life of the superalloys, one example is shown in Figure 1. 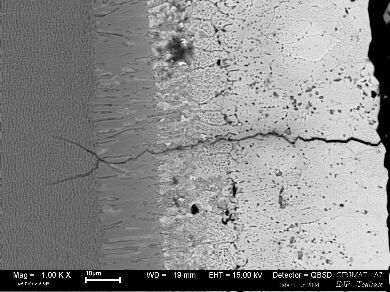 The initiation mechanism was brittle fatigue fracture of the coatings which provided an initial defect at the coatings from which a crack grew into the substrate. At 900°C, the fatigue lives of the coated specimens are longer in comparison with the uncoated specimens except for RT22 coated on SCB. Since RT22 is a brittle coating becuase of the lack of ductility in the NiAl-phase, it is impossible for it to follow the more ductile substrate, leading to early fatigue crack initiation. 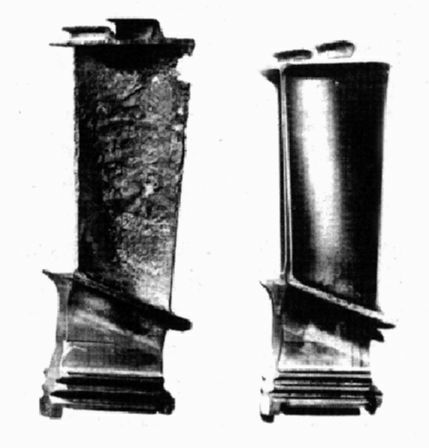 Figure 2 is an example of the fracture of the diffusion coating RT22 deposited on the single crystal superalloy SCB tested at 900°C under 1.2% while Figure 3 shows cracks formed on SCB coated with RT22 and tested at 900°C and 1.0%. 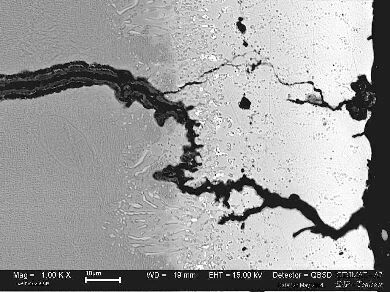 The beneficial effect of the coatings can be coupled to their good ductility over the ductile-brittle transition temperature and the slower propagation of cracks caused by oxidation at the front of the crack tip. The OP-TMF life of the coated specimens is shorter when compared to the uncoated specimens. All TMF tested specimens have shorter fatigue life than LCF tested specimens. IN792 gives shortest life (both LCF and TMF) of all coated systems. The OP-TMF life of the coated CMSX-4 was longer than of the coated SCB specimens. The AMDRY997 coated specimens exhibit slightly longer fatigue life than the other studied coatings. 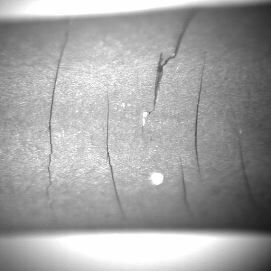 The cracks were developed in the coatings through the formation of the surface cracks on the coatings during TMF, Figure 4. Figure 4: CMSX4, IC1 coating. The TMF life of the coated systems was controlled by the mechanical strain amplitude and cracking of the coatings during the tensile stress cycle existing at the lower temperatures during OP-TMF. 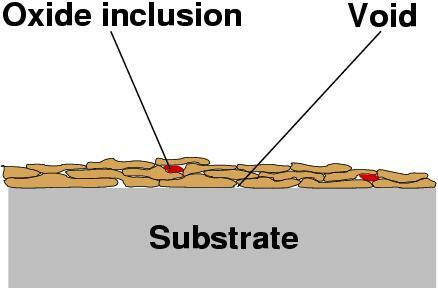 The cracks stopped at the coating-substrate interface in most cases acting as fatigue crack initiation sites in the substrate. Then, the crack initiation was accelerated by oxidation, Figure 5 (shows SCB coated with RT22 tested under TMF). Thermal barrier coatings (PDF), provided courtesy of Materials World. The creation of this document was supported by the Higher Education Funding Council for England, via the U.K. Centre for Materials Education. Some of the above comes from discussions with J. Wells, RWE Innogy and S. Tin, Rolls-Royce UTC. Abradable Coatings Increase Gas Turbine Engine Efficiency.